It’s been two years since the Kony 2012 video went viral, and after shooting star-like rise to fame and subsequent critical analysis and fall, the Invisible Children movement is more or less, well, Invisible. The video was a documentary made by three college age students and highlighted the child soldiers in Uganda and the “night walkers”, Ugandan children who would walk into local cities to sleep safely at night in order to avoid becoming child soldiers. The video is perceived as a call to action- donate to their organization, and you can help stop Joseph Kony and free children soldiers. Just as quickly as everyone began posting the video on Facebook, Twitter, and social media, critics began slamming the video as inaccurate representation of the real-time situation on the ground in Uganda. They claimed that Kony hadn’t been seen for years and the short film was just that, a film. While the organization Invisible Children did (and continues to) have good intentions of helping children in Uganda, their lack of transparency created controversy and confusion among young people about how to do good in the world, and who to believe. The trend of using social media to promote development is a dangerous one, as proven by the Kony campaign. It can be instantaneously effective and reach a huge audience. However, the population reached can often be uninformed and easily hooked into a cause. The topic of cyber security this week reminded me of the Kony campaign, and how simple it is for something- like a short video- to spread so quickly on the internet. It’s different from a virus or cyber attack, but can be damaging to the developing world all the same. 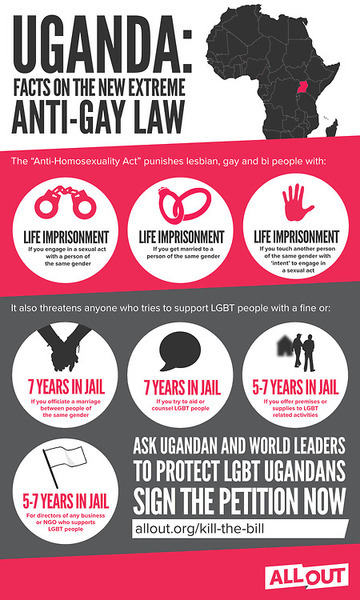 The web, radio, and television have been flooded recently with the news about Uganda’s Anti-Gay Bill, sentencing homosexuals, or people who commit homosexual acts to anywhere between 5 years and life in prison. The specifics of the bill can be seen here to the left, and, as you can imagine, it has been causing international uproar. Today on the web I saw an article with a graphic photo of a supposedly homosexual man being burned alive in front of a group of people which included many children. That image made me want to write about whats going on in Uganda for my blog this week, and how whats happening there is associated with ICTs. First of all, its amazing how fast news flies these days; uproar began even before the bill was signed, as early as 2009 when it was first being introduced. Since then foreign diplomats have been pressuring the Ugandan government to not sign the bill but, as we all know, it was to no avail. The World Bank now has said that it will delay a huge loan it had promised the nation because of this bill. Now some of the biggest worries for Ugandans and the international community alike are about the safety of people who may be at risk. Jail is not even the type of risk that is most concerning, but the fact that gays are being beaten, killed, and denied services such as healthcare in their own countries. So what does this all have to do with ICTs? First of all, without the Internet the international community would have much less influence over the happenings in other parts of the world. Amnesty International immediately set up a protest petition, gaining over 200,000 signatures within a few days. The hashtag #uganda has surged suddenly, leading to thousands of tweets about whats going on in that country an opinions on the bill. Mobile phone users have captured incredible and horrifying images of protests and human rights abuses and are putting them on the web for the whole world to see. ICTs have given us the power to do this, to effect change thousands of miles away, to support protesters, or to watch entire nations collapse. So what can ICTs do now? Can ICTs be useful in times like this? In places like Uganda? ICTs showed us whats going on, and sparked the discussion on how to change it- but can ICTs really do anything on the ground in real time to help the people whose lives are at risk? I think so. I wonder if we will see any apps spring up that could help, because there’s an app for everything, as the saying goes. Maybe an app that will locate clinics that will treat open homosexuals? Though to access the app you would have to know a secret password or something so that the possibly life-saving information stays with the people that need it rather than in the hands of the wrong people. So maybe that wouldn’t work too well, but there has to something- what do you think? How could ICTs be used in this situation? I’m not sure, I’ll keep brainstorming, but lets get the conversation started. Now that the global social-media network and development critics alike have had sufficient time to ponder, and as news spreads that Joseph Kony, the leader of the Lord’s Resistance Army, is in peace talks, what is the final verdict on Kony 2012? We know now that the campaign was a bit misleading, as it inferred that Kony and his rebel army were still committing atrocities in northern Uganda, while they had actually been in hiding somewhere in either South Sudan, C.A.R or Congo (we now know C.A.R.) for some six years, depleted and in dissaray. When this came to be known in the Western World, along with questions about Invisible Children’s finances and its founder, there was a tremendous backlash against the advocacy group. As quick as it came, Kony 2012 went from being the most passionate and popular humanitarian advocacy campaign since Save Darfur, to a laughing stock and seriously “uncool.” Consequently, the campaign’s untimeliness and inaccuracies prevented Invisible Children from fulfilling its goal of having people all over the world marching for Kony’s arrest–assumedly, people didn’t want to be associated with such a failure. As a sort of epilogue, I offer yet another video that I feel is very important not just in talks about Kony, but all humanitarian media initiatives. Kony 2012 further painted a picture of Uganda, and Africa as a whole, as a place of unimaginable savagery, violence and anguish. Though readers and contributors of this blog are probably well-versed in the tragedies of Africa’s past and present, war and suffering are not the entire picture. In this week’s lecture by Ralph Russo and previous discussion about cyber security I was intrigued about the extent of cyber security protocols and standards that are present in Uganda. From my research on ICTs in the business and industry sector in Uganda I was aware that security for both the companies and the consumer was an issue. The above video gives a wonderful overview of the effects of cyber crime on businesses, with losses ranging in the billions of shillings (1 USD to 2,160 USH), and that NITA-U has set up a task force to create safe e-commerce networks. NITA-U isn’t the only task force on the cyber security scene though. A February All Africa article shares that the Computer Warehouse Group (CWG) partnered with Symantec in order to provide security storage and management solutions to one of Africa’s fastest growing telecommunications companies. But its not just the private sector that is standing up against cyber crime. In a 2013 article from IT News Africa the Ugandan government also established a Computer Emergency Response Team (CERT) under the country’s Communications Commission (UCC) in order to more effectively detect cyber crime. CERT is equipped with state of the art equipment and IT experts that will aid in the continuos and growing battle against cyber crime in conjunction with the International Telecommunication Union (ITU). With the pace that technology is evolving it seems like an immeasurable feat to keep up with the high rates of cyber crime and as Ralph Russo shared with us it is important to keep connections with those entities attempting to put a stop to cyber crime. As seen in examples above Uganda is creating a firm platform, consisting of both public and private organizations, aimed to stop cyber crime and create a more secure environment for businesses to grow and thrive. In Plan’s 2010 ICT Enabled Development report they focused on a number of challenges and solutions to the use of ICTs in the developing world by using profiles of numerous countries. One country they focused on was Uganda and since I am focusing on Uganda for my research I was inspired to look more into what Plan was prescribing for Uganda’s ICT development problems. Plan’s work in Uganda has centered around four main elements, including children’s participation and ICTs in education. The role of children in ICT work is something that we have discussed in class briefly under the subject of the One Laptop Per Child project but not much in a positive light. After reading about the need Plan identified in seeking greater access for children I sought to find a project that was implementing ICTs in education and having a positive impact. Plan’s report makes a note of the broad improvements of ICTs in the over all education system fore example: the numbers of trained teachers and desktop computers being introduced, but I wanted to see a project and direct application of ICTs in education. Upon my research I found a project called, Inspiring Science Education for Girls Using Information Communication Technology. This project, founded in 2006, has three major objectives: encourage more girls into sciences, improve girls’ self-esteem and confidence, and improve performance of girls in sciences. These objectives were designed after research on the number of girls enrolled in science programs and the identification of a need to increase these numbers and the overall benefit it could have on the female and overall population. The project works to give girls access to positive mentors in the science fields through ICT camps and individual, well trained, teacher. It also works to provide an outlet to share information and projects through the organization of science fairs. Lastly it increases access to computers (over 1,000 refurbished computers have been delivered) that have networking capabilities. With these computers comes access to research tools and the formation of an online repository of learning resources . This resource is the most interesting aspect of the project and, in my opinion, a large step forward in connecting the girls in the program to past work as well as, indirectly, connecting them to each other. Since its inception Inspiring Science Education for Girls Using Information Communication Technology has seen ten more schools wish to participate in the program and has trained more than 100 teachers. This project can be used as a vest practices example and is inline with Plan’s ICT vision and work in Uganda. There was little evidence that spoke negatively of this project and I feel that, from my research, this project has made strides in increasing the use of ICTs in education through internet and computer access. After reading Abraham’s research article “Mobile Phones and Economic Development: Evidence From the Fishing Industry in India” and our classes discussion on how ICTs can impact developing economies, I became really interested in other ways mobiles can help foster development. Throughout my research I stumbled across the Grameen Foundation, who has recently partook in the Community Knowledge Worker (CKW) initiative. This program “helps poor, rural farmers in Uganda by providing them with up-to-date, accurate information” through the use of smart phones (Grameen Foundation). Community Knowledge Workers are local Ugandan natives who are equipped with smart phones in order to give ‘fellow farmers vital information on treating their diseased crops and sick animals, the best crops to plant and when to plant them based on weather forecast, and market prices at different locations (Grameen Foundation).” Much like the Farm Radio International initiative, CKW hopes to increase farming efficiency and productivity in order to advance Uganda’s developing economy.